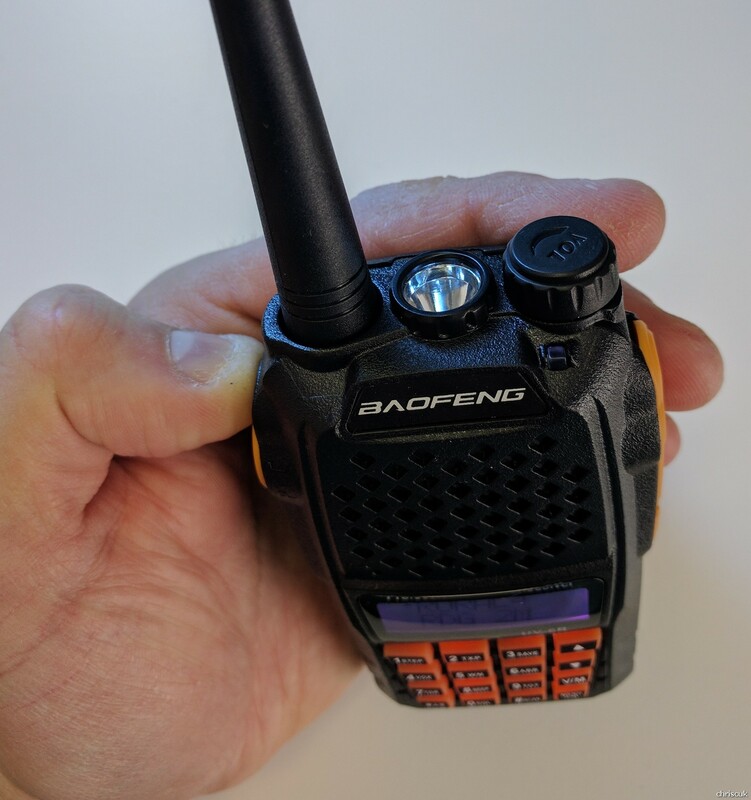 I know this forum is mainly for flashlights but seeing that Banggood sell lots of other gadgets and seeing that there are already a number of Radio Hams on this forum I thought I’d take the opportunity to get hold of a Baofeng UV-6R to add to my collection of hand held radios. I’ve mostly given up Amateur radio, going from a £1500 main radio and a £1000 radio just on standby with a large selection of antennas to keeping just a few handhelds and a Yaesu FT857 in the car for when I want to play a bit. These little cheap handhelds have really kept my interest as without them I probably wouldn’t be bothered most of the time. Over time I’ve had the Wouxun KG-UVD1P which I didn’t treat too well. It died. I then had the Baofeng UV-3R, this too died because a friend dropped it in a pond. The radio will occasionally power up but I just keep it to remind me of how funky and small it is. I then found the “amazing” Baofeng UV-5R’s. I have a couple of them. They’re great, easy to program, easy to use, sturdy etc but for some reason I never decided to try a Baofeng UV-6R – until now. As with most items from overseas you get a big brown box full of the toys. This is no exception apart from this one was either opened by customs or it was so full of stuff it simply didn’t want to fit and was bulging waiting for me to open it. A manual. Never enough information if you ask me! The radio main body – and the battery separately wrapped. A belt clip with no screws – the screws are already on the back of the radio to save you losing them. A power brick – 10v @ 0.5A. This radio will work being plugged into a 12v charger and with the chargers for the UV-5R. I received a EU plug on my adaptor so being lazy I just dropped the radio into the UV-5R dock and charged it up. I quickly unpackaged the radio and put it all together. In the rush I wasn’t quite accurate enough with putting the battery on the radio so I thought the battery was discharged when I received it. 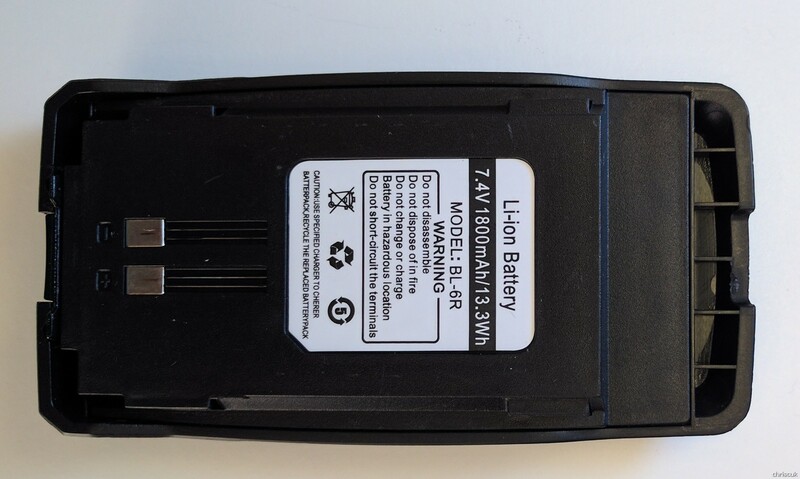 The battery is the same voltage and same capacity as the one that comes with the UV-5R (7.4v and 1800mah) but the battery is rather different. This one is physically larger and looks like it is made bigger to make the radio better to hold in the hand. Whilst the UV-5R has a button to release the battery on the top this UV-6R has a button on the bottom to release the battery. I wedged the battery in and didn’t follow the slots so on the video I made the radio wouldn’t fire up at first!. One of the first things I noticed other than the button layout was the button feel. The PTT button has been changed from a hard plastic button to a squishy rubber PTT button – much like the keys on the radio. This feels much nicer to use. By changing the layout of the keyboard they’ve removed the “Band” key, the VFO/MR key and the A/B switch. I got pretty used to the A/B key being a big blue button on the UV-5R but after a morning of playing with the UV-6R the A/B switch seems to be nicely located and you don’t accidentally press it. I think Baofeng have gone for a more user friendly and logical approach with their keys. The changing of the key layout has allowed the radio to have a much larger speaker. As I mentioned above the speaker on this radio is much larger and sounds better in every way. It goes louder and has a wider frequency response. People sound clearer and if you’re using it outdoors you’ll certainly hear people over any background noise. Honestly I never said that the UV-5R was too quiet nor did I ever think “If only it had a bit more bass” but after hearing the difference it is noticeable and it is nice to have. Okay this one could be important for you flash-a-holics. This light has a much more useful LED inside it to act as a torch. I have no idea why they first thought putting an LED in one of these radios was a good idea and to be fair in the UV-5R it was utterly pointless. Just a LED poking out of the top of the radio. It was almost useless! On the UV-6R it’s actually an emitter into a reflector that can be usable in a variety of situations. It’ll do two modes, on and strobe. I find it quite funny that it only does strobe rather than SOS considering it is a radio, you’d think it’d have a bit of Morse code in it but no. I remembered how poor the light was on my UV-5R so had to check that too, it’s on/strobe too. The menu on this radio is the same as the UV-5R. Out of the box the radio is set to speak which setting you are on and it’s full of annoying bleeps and noises. After a minute of playing I turned off the beeps and the voice system as I didn’t need it to tell me which mode or menu I was adjusting. This would be great if you are visually impaired. One of my local operators uses his in this mode as it’s the only way he can operate the radio. Programming this radio turns it from a simple radio into a powerful tool. There are a number of different applications that you can use to set the radio up. I use “CHIRP”. It’s free and easy to use. In CHIRP click Radio  Download from radio and it’ll load all of the config settings and channels. You can then modify the settings and make changes. 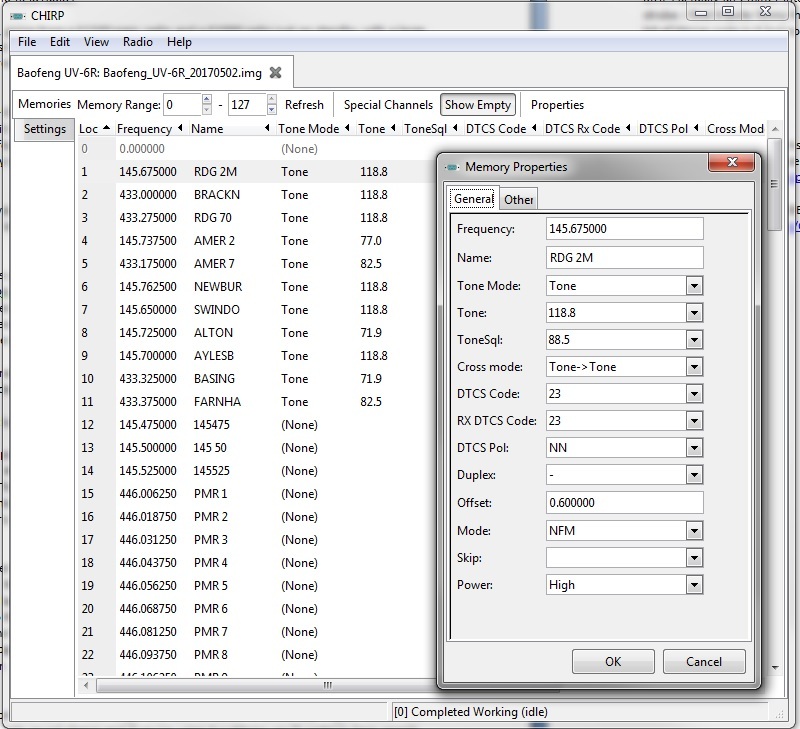 This method lets you program channels and set up repeaters easily. 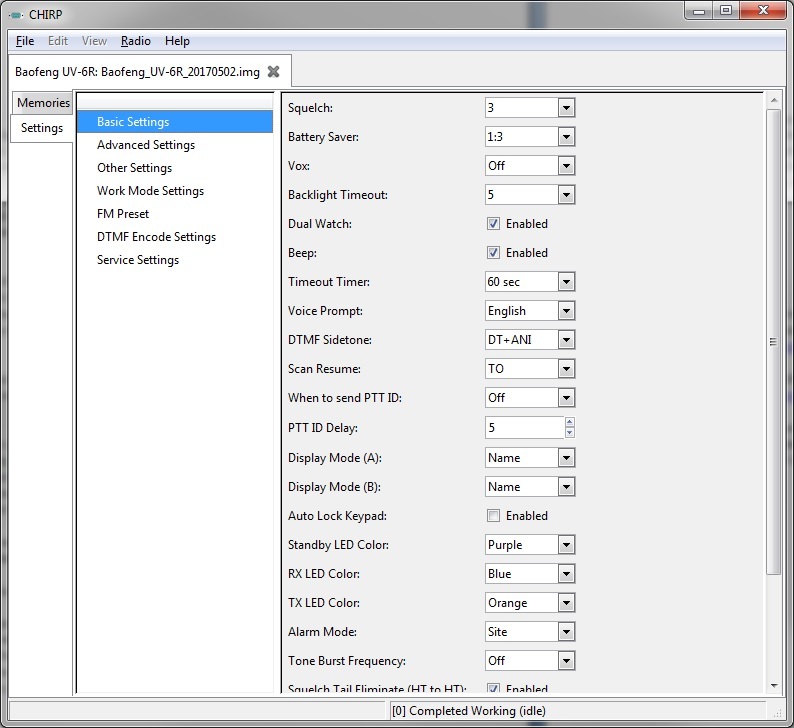 You can then just click Radio  Upload and your radio will start up again with all the settings and channels set up. You can program the radio using buttons on the radio and various menus. I got annoyed at this in the past with other radios so didn’t even bother with this. I simply grabbed the channel setup from a UV5-R and copied them over. This took a matter of seconds so I didn’t bother trying. I have programmed a couple of channels on an old radio manually so I know it is possible but I didn’t wish to do this to the UV-6R this time. I’m really glad I decided to try out the UV-6R at long last. The radio is “cheap” compared to the big brand names but it seems fully feature packed. Comparing it to my much loved UV-5R’s the radio feels better in the hand. It just feels more rugged and it feels like it’d survive better being treated badly. The 5R’s have suffered some abuse at my hands but this feels like it’d take more abuse. The radio does seemingly everything you need from a dual band hand held. The power output is ample and the receive is just as good, if not a smidge better than the UV5R. The louder speaker is very clear and loud if you need it and the audio from the microphone is “excellent” from the few people that I’ve spoke to. 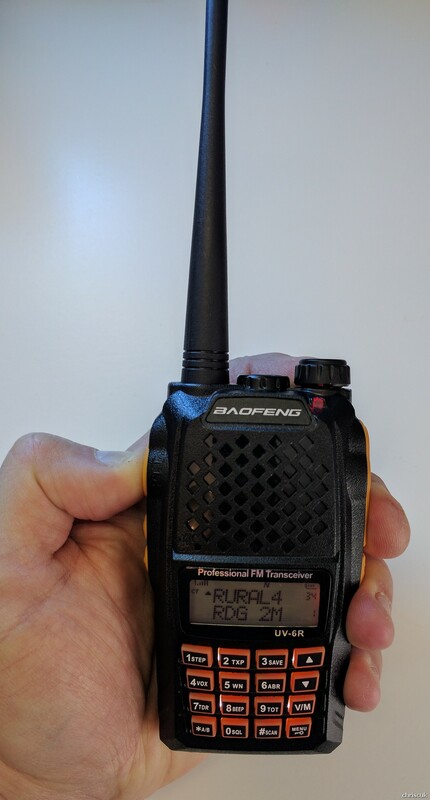 People have always commented very favorably about the audio for the Baofeng handheld radios and this radio has great quality transmission audio just like the others. I’ve not tried the mobile radios so I can’t comment on those. The one thing this radio lacks is air band (AM) receive. None of the “cheap” handhelds have it so it’s not really missing as such, it’d just be a nice addition if they had it. All in all I’d give this radio a five out of five. It’s a nice step up from the UV-5R but at the same time it retains all of the good points of the UV-5R. The final point to add is that the microphones, speakers, USB cables and antennas are all interchangeable between the UV-5R and the UV-6R which is great and there is a huge range of accessories available such as antenna adaptors or battery eliminators for use in the car. thank you for the test, I have a variety of UV5R, including the TP (8W). so far they are all worth more than what I paid for. Sorry, I missed out the photos first time around. It’s a really nice radio. I’ve been meaning to pick up one of the Chinese HTs to throw in my camping tote- I keep forgetting to bring my VX-8R with me, and being able to monitor NOAA WX broadcasts as well as the local Skywarn repeaters has always been useful. local emergency agencies like CalFire and others? A question along Travis’s line, do these scan the UHF channels? Thanks for the review. A question along Travis’s line, do these scan the UHF channels? Yep, albeit rather slowly. You can either scan the full VHF or UHF frequency range supported by the radio in the increment that you choose, or else put it in channel mode and scan all of your saved channels in whatever band or order you programmed them in. This looks like another great Baofeng product. Thanks a lot chrisc for the excellent review and comparison. I might have one of these coming in the mail, although the eBay seller’s account appears to have been suspended so it could have been a scam. At any rate, the only important difference I can see compared to my UV-82 is the lack of a metal chassis on the UV-6R, which is a bit of a regression in my opinion. It also doesn’t have the compact good looks and clean lines of the UV-5R or the traditional Motorola “professional radio” look of the UV-82. Do you think the 8W models are worth the (slightly) higher price? Any measurable difference in performance compared to the normal 4-5W models? Can you tell if the TP actually puts out the advertised 8W? Depends, some of them are switching to private trunked Motorola systems which, in addition to being digitally encrypted, are also in a higher frequency band that is out of the range of all consumer HTs. Thanks sb. Are these items another interest of yours? Thank you chrisc. Great info. For folks knowledgeable in US laws, can this radio be used by someone without a Ham Radio License if they stick to certain frequencies? If yes, would it have greater range that typical higher-end non-Ham walkie talkies under similar conditions (osticals, etc? How come label on the radio in the OP is labeld "Baofeng", but the labels on the BG product page say "pofung"? Yep. Always has been, although I never owned a VHF / UHF / ham radio until recently. I’m seriously impressed with my UV-82 in terms of build quality, features, and reception for the price. How come label on the radio in the OP is labeld “Baofeng”, but the labels on the BG product page say “pofung”? “Pofung” is another brand name created by Baofeng as an attempt to make it more pronounceable in the Western world. Apparently the Chinese phonetic pronunciation of the word “Baofeng” is actually closer to “Pofung”. But the Baofeng name is already quite famous worldwide, so they also continue to sell units under that brand name. They’re both identical otherwise. For folks knowledgeable in US laws, can this radio be used by someone without a Ham Radio License if they stick to certain frequencies? Longer answer: eeeehhhh… It’s likely that no one would find out if you were using it on (for instance) FRS or GMRS frequencies. I wouldn’t do it (I already have an amateur license), but, hey, it’s a free country! Short answer: No. Longer answer: eeeehhhh... It's likely that no one would find out if you were using it on (for instance) FRS or GMRS frequencies. I wouldn't do it (I already have an amateur license), but, hey, it's a free country! Much appreciated Herb. Getting the basic license has been on my wish list. I have obtained materials to study to prepare for the test, but I'm still dragging my feet on the actual studying. A ham buddy has a SWR meter and one day we got tired of lights, cars and other stuff and decided to measure all HTs we had flying around! The 8W on the latest Baofengs is an actual improvement, the meter showed approx. 7.5W (analog meter, so not very exact). I personally don’t think I’ll need more than 5W power as most of my repeaters are not far away and my other use cases are driving with friends, shopping malls or something like that. The UVR5 TP I bought was from Sainstore nextbigthink and was on sale/the same price as other 5W were advertised. I am pretty sure Baofeng is like the ThorFire or Convoy of ham radio. Also the extra power on some of the rubbish antennas could be more harm than good. They aren’t known for being the best tuned antennas but the radios are really hardy and dont mind a massive antenna mismatch. Thanks for the informative review! I remember being interested in HAM radio in my earlier days. At that time the radios were HUGE and you could talk to people all over the world. 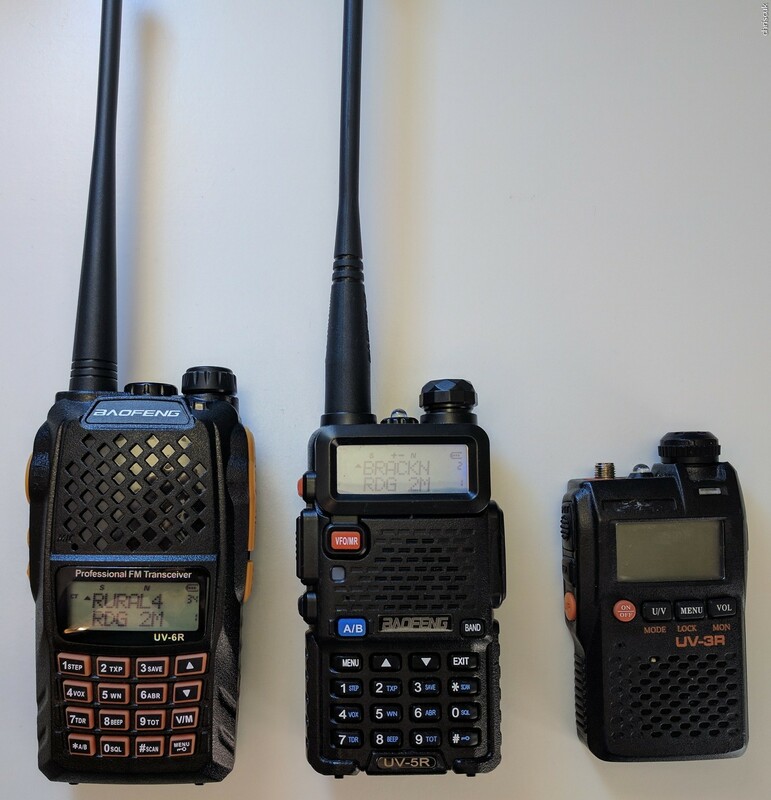 Are the current radios still so large and how does the UV-R6 compare to those radios ability to communicate all over the world? Also, how does one go about obtaining a HAM license (testing, cost, etc.)? Lastly, the UV-6R appears to be out of stock at BG currently, would you recommend the 5R or waiting for the 6R? …how does the UV-R6 compare to those radios ability to communicate all over the world? Also, how does one go about obtaining a HAM license (testing, cost, etc.)? Lastly, the UV-6R appears to be out of stock at BG currently, would you recommend the 5R or waiting for the 6R? The range all depends on the frequency being used. 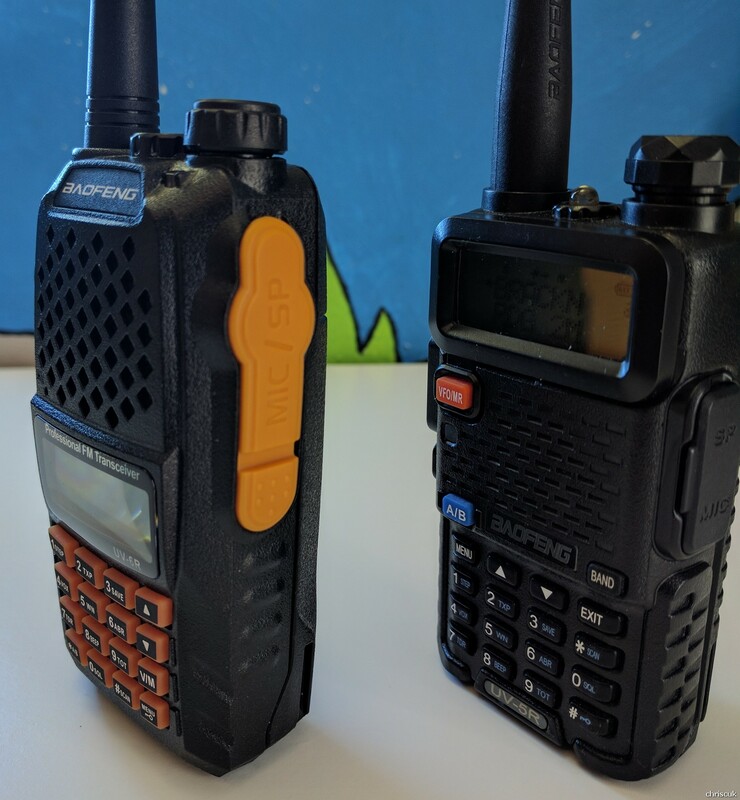 The 2m (144 MHz – 148 MHz) and 70cm (420 MHz – 450 MHz) very-high and ultra-high frequency bands that Baofeng supports definitely won’t work for worldwide communication, in fact you’ll be lucky to talk to the closest nearby city. The ham frequencies that are good for communication across the world or to the ISS are in the low, medium, and high frequency bands (ref), and the Baofeng models don’t support those bands. Make sure that you can legally use the Baofeng models where you live, and on what frequencies. If so, there’s definitely no reason to wait for the UV-6R, although you can readily find it on eBay if you prefer its styling. Inside the shell, it’s basically a UV-82, which is also an excellent option. The UV-5R is also great, as are the BF-F8+ and GT-3 Mark-II and Mark-III. Thank you sb! 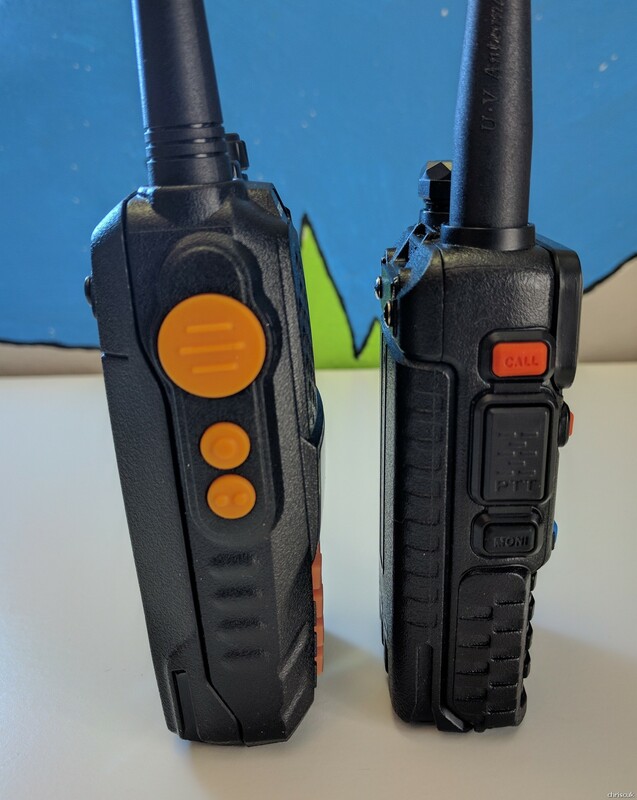 So, in light of what you stated regarding reception, what exactly is the a radio like the UV-6R used for and how does it differ from a walkie talkie? There are hams that use them for chatting with other local hams, and some areas have repeaters with high antennas that allow them to extend the coverage a bit. But aside from that, they’re mainly useful for groups of people or organizations / companies to communicate with other members within a fairly small local area. In that sense, they are basically walkie talkies, in other words, handheld radios. 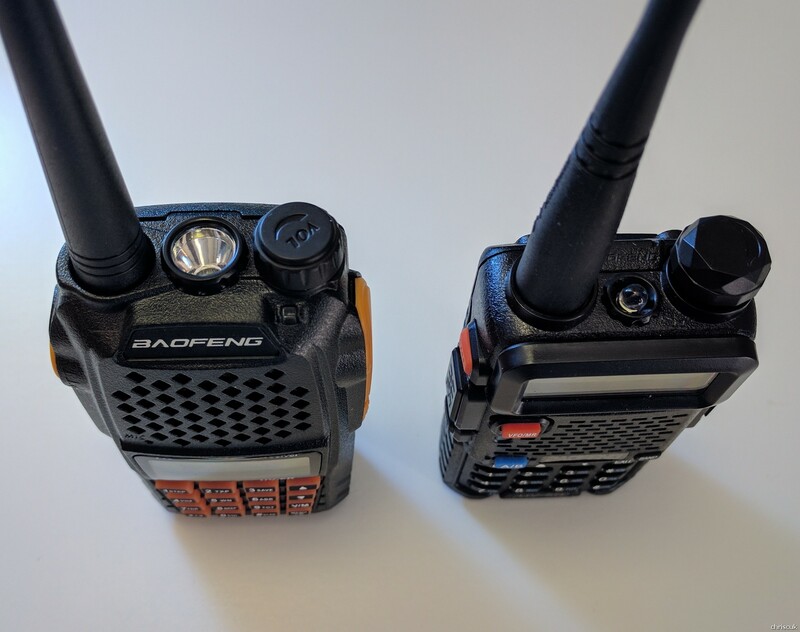 The Baofengs are just special because of their affordable price and feature set, combined with removable antennas and batteries and higher transmit power compared to the little FRS radios that they sell in plastic packs as outdoor sports accessories. The Baofengs can also be configured to communicate with those FRS radios, but again it’s a legal gray area in many countries. OK, so basically they are a super long distance walkie talkie? So, if one purchased multiple UV-R6’s, this is something that one could use to communicate with friends and family within their town for example? Super flexible, I’d say. And yes, they should be sufficient to communicate with friends and family within their town, but there’s a lot of factors that can drastically increase or decrease the effective range. How about the licensing; what is required and how much would it cost? That’s a considerably more complex question, depends on the country and the usage case. Assuming you’re still in Florida, the ARRL has a page that has links to exam material, study guides, and testing dates and locations. The testing fee is usually $15, IIRC, and that includes taking all three license tests (if you want, it’s not required). Baofeng keeps changing the outer case without doing much internally . I would like to see the toy features removed ( Flashlight / alarm ) , and some serious internal upgrades . Don’t get me wrong , I really appreciate what Baofeng has done , I just dont care for the side order of junk . And they just keep adding new cases to the internals and calling them new models … ( ? ) I guess car companies do it all the time .. My last Baofeng will be the GT3tp ( Famous last words ) , and I will move the rest out the door . I have the Tonfa – TYT – UV-82 – UV-5r – GT3 ( MK1 ) and a Baojie 218 …… I will see how good or bad the GT3tp is , I may just end up with two GT3’s … And if anyone is looking for a killer antenna ( Kinnota AZ507R ) , it is simply BOSS ! Another 10 minutes and it should be dark out ! Take the F1 for a walk .. Thank you Sir, I appreciate the info! I’ve just been given one of these as a present to replace my defective UV-5R. It seems to be going OK apart from being a bit over sensitive on the squelch front. The keypad lights keep lighting up randomly which I assume is caused by a momentary signal breaking through. I have tried programming the squelch settings via Chirp (as I did for the UV-5R) but i’m not sure if it is taking them as when I read the data back into chirp the original squelch values are there. Chirp does report it is using an experimental driver, so maybe this may get fixed sometime? Anyway I will keep on testing and see how it goes. Agree with the antennae comment. The stock one needs to go to really help out. The pictured nagoya is what I went to as well. Seems well worth it. The test isn’t hard to get a tech license now that there is no code requirement in the US.